VDOT is now seeking W&OD trail user opinions on the experimental Rectangular Rapid Flashing Beacon (RRFB) system that was installed at the intersection of the W&OD Trail and Belmont Ridge Rd in April 2013. We are hoping that you would be able to assist VDOT by distributing the survey link to your club members. Survey responses will help VDOT gauge the effectiveness of the RRFB system and help decision-makers assess the prospects of installing RRFB systems at other locations in the future. 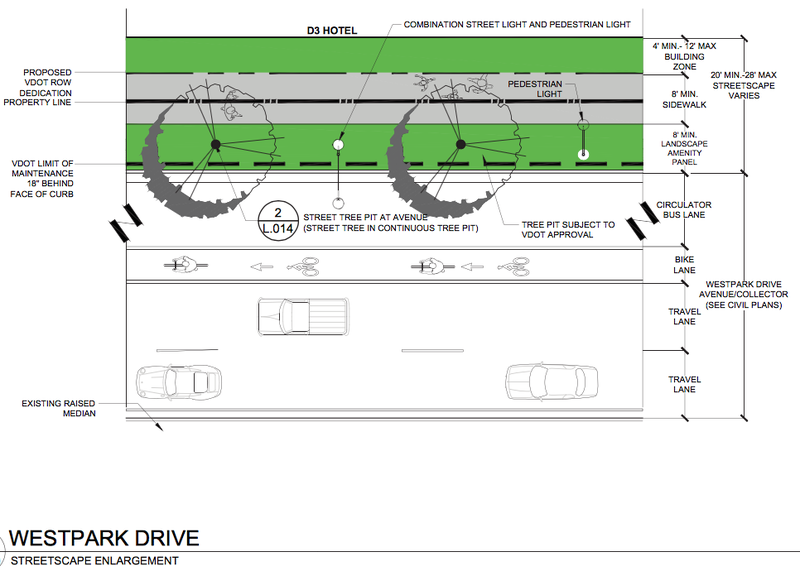 On-street bike lanes are proposed along Westpark Drive (five-foot wide) and Park Avenue (six-foot wide). Local roads such as Madison Street are expected to accommodate bike traffic without the need for separate lanes because of their lower speeds. Bike parking facilities are not specifically identified on the CDP or FDP. Staff is recommending an FDP condition that interior bicycle parking areas be identified on site plan and/or building plans to the satisfaction of FCDOT. Additionally, staff is recommending an FDP condition that bicycle parking facilities be installed in the interim public parks subject to the approval of FCDOT and FCPA. Fairfax County signed off on another new development in the heart of Tysons that will add up to 1.4 million square feet in stores, apartments, hotel rooms, plus an estimated 2,275 new residents. The Fairfax County Board of Supervisors approved Westpark Plaza today, a 5.37-acre project that’s about a quarter mile from the Greensboro Metro station.It joins Tysons Central, which the county approved almost a year ago, an up to 1.8 million square foot project next to this Silver Line station. The plan calls for two high-rise apartments, an up to 300-room hotel, and a one-story recreation building built around a 1.78-acre park. The buildings all offer access to this central green with a lawn, courts, and more. The recreation facility offers a year-round, indoor swimming pool for residents and hotel guests, along with other amenities. Located at the corner of Leesburg Pike and Westpark Drive, the new development will form a single block, bounded by two new streets, Park Avenue to the north and Madison Street to the east. 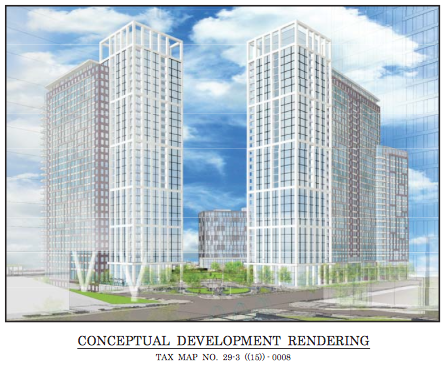 It will replace the existing nine-story Westpark Hotel and surrounding parking lots that stand on the site today. 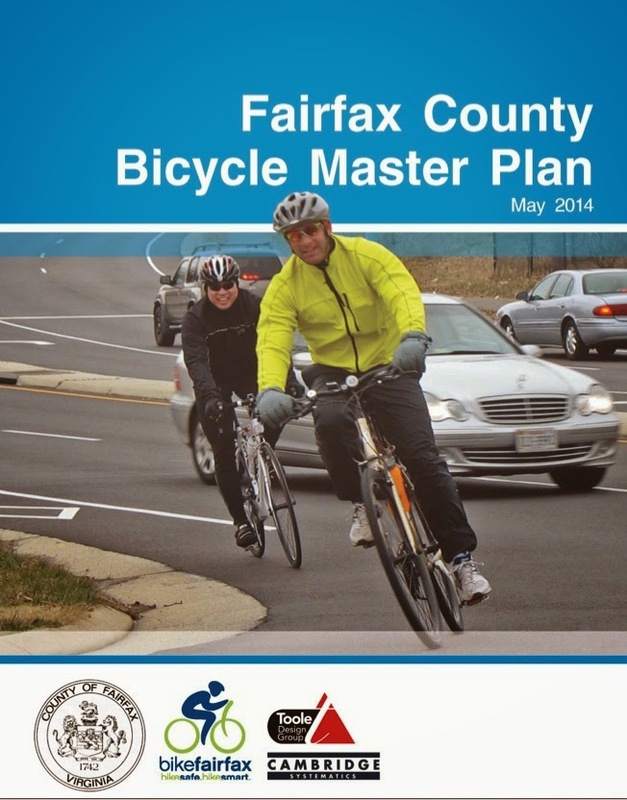 The Fairfax County Board of Supervisors unanimously adopted the county's first-ever Bicycle Master Plan on October 28. The plan is now officially incorporated into the Transportation component of the Comprehensive Plan. Thanks to the Board and the Planning Commission for their support. A special thanks to everyone who took the time to attend the final public hearings and who testified in support of the plan. Thanks also to the more than 850 people who signed the FABB/WABA petitions. Bike Fairfax - Creation of Bike Fairfax for conducting bicycle encouragement and education programs. The program "should have a dedicated staff, separate from the FCDOT Bike Program staff. It would require its own funding to support program administration, marketing materials and events." The 2014 Transportation Bond was approved by over 70% of voters. The $100 million bond includes $77.5 million in pedestrian projects, $6.5 million in bike projects, and $16 million in spot road projects. The vote shows that Fairfax residents want safe pedestrian and bicycle routes. Thank you Fairfax voters! The Fairfax County Park Authority Board recently approved a comprehensive parks plan for Tysons. The plan includes a recreational trail loop connecting many of the current and future parks. "As Tysons transforms from a suburban commercial center to a major regional urban center, a connected network of urban parks will help to distinguish Tysons as a great urban area and bring benefits to the local economy and quality of life. To help ensure that happens, the Park Authority developed a comprehensive park system concept plan for Tysons." See related info on the Tysons Park Planning project website. VDOT has nearly completed the first phase of repairs on the Fairfax County Parkway Trail, from Route 7 to Route 50. Several of the most damaged sections of the trail have been repaved. Also, NVRPA recently repaved a major section of the W&OD Trail, from Crestview Dr in Herndon west to Ashburn Rd. From the Washington Post: "The Parks and Recreation Department has purchased two small plows to clear up to 10 miles of Arlington’s busiest trails after each snowfall. At the same time, the Environmental Services Department will launch a pilot program to pretreat and clear snow from the protected bike lanes that have been established on some county streets. "The targeted areas include 5.2 miles of the Custis trail from Lynn Street to the Washington & Old Dominion trail; 1.25 miles of the Bluemont Junction trail from Fairfax Drive to the W&OD; 2.25 miles of the Four Mile Run trail from National Airport to Shirlington Road; and 0.4 miles of the Route 110 trail between the Iwo Jima Memorial and Arlington Cemetery." Reston Association recently sponsored a talk by Mark Fenton, a nationally known consultant on building healthy, more physically active communities. 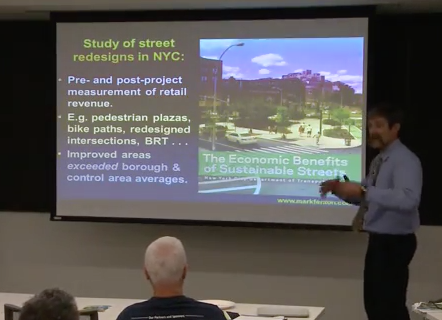 Mark's talk was filmed and the video of the Healthy Community Design Workshop is now online. It's well worth taking the time to view the presentation. Mark presents an excellent summary of the reasons we need physically active communities to help combat obesity and diabetes, very preventable and costly diseases. At a November design workshop sponsored by Fairfax City and George Mason University, transportation consultants recommended restriping University Drive for bike lanes between the Mason campus and downtown Fairfax. More than 200 individuals attended the three-day workshop, which focused on developing various short-term and long-term visions for strengthening the Mason-Fairfax City connection. Downtown Fairfax City is about 1 ½ miles from the Mason campus, an ideal distance for bicycling. The recommendation included a road diet for the north end of University Drive approaching downtown. The City will be evaluating the workshop recommendations in the coming months. See the final workshop presentation. To get involved in advocating for implementing these recommendations, contact Douglas Stewart at douglasbstewart@gmail.com. 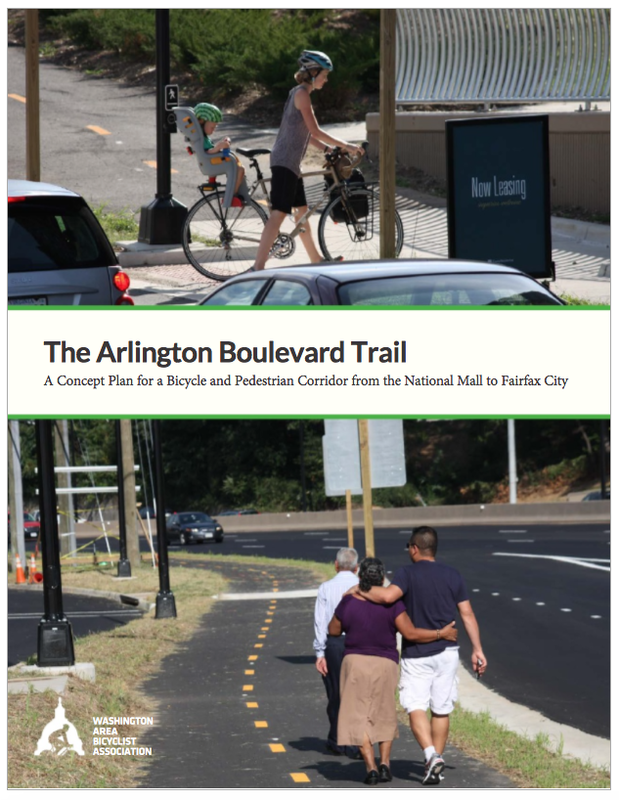 Yesterday WABA released a plan for creation of a connected bike trail along Route 50 from Arlington to Fairfax City, the Arlington Boulevard Trail Concept Plan. Bike facilities on Route 50 are a high priority for FABB and WABA. Thanks to WABA for putting together this plan. Now the local jurisdictions, working with VDOT, have concrete guidance for building of this trail. Arlington Boulevard runs just over twelve miles from the National Mall in Washington, DC to Fairfax City, VA, crossing several jurisdictional lines and the Potomac River along the way. The thoroughfare connects over 110,000 people living in the adjacent neighborhoods to oﬃces, retail, parks, schools, and government services. But it lacks a consistent, high-quality bicycling route. Such a route would encourage bicycling and walking along its length, increase the value of existing bicycle and pedestrian facilities by making them part of a more connected network, and improve the character of the corridor for all users. The Virginia Department of Transportation (VDOT) and the Metropolitan Washington Council of Governments (MWCOG) have identiﬁed this route as an import-ant, yet underdeveloped, bicycle route in several planning documents--but to date, improvements have been piecemeal. This document shows how those piecemeal improvements could combine to form a functional trail for transportation and recreation. The Bike Lane is partnering with MORE (our local mountain bike club) and PeopleforBikes to use the donations to build pump tracks (bike playgrounds) and youth bike facilities in Fairfax County. Want to be a corporate sponsor to get more kids riding? Contact Anne Mader at anne@thebikelane.com for details on how your company can help our Round Up for Better Riding Program to get more kids riding bikes in our community.opleForBikes will match every donation. Let's get more kids riding! Ask a Bike Lane employee for more information. Read more about this program and what The Bike Lane is doing to support local cycling at PeopleForBikes retailers in action: Virginia's The Bike Lane. Reston Association recently sponsored a talk by Mark Fenton, nationally known consultant on building healthy, more physically active communities. Mark's talk was filmed and the video of the Healthy Community Design Workshop is now online. Mark asks the rhetorical question, if you build a physically active community, will it work, will people get out of their cars and bike, walk, and take transit? His answer is yes if you have a mix of land uses, a connected ped/bike/transit network, inviting designs and destinations, and it's safe and fully accessible for everyone. It's well worth taking the time to view the presentation. Mark presents an excellent summary of the reasons we need physically active communities to help combat obesity and what was once adult onset diabetes, very preventable diseases that everyone ends up paying to treat through increased health care costs. Another good resource is a slide presentation on this topic from Mark's website. According to the unofficial results from Fairfax County, the 2014 Transportation Bond was approved 214,344 to 83,999. The $100 million bond includes $77.5 million in pedestrian projects, $6.5 million in bike projects, and $16 million in spot road projects. The vote shows that Fairfax residents want safe walk and bike routes and they are willing to pay for them. Even though Springfield District Supervisor Herrity opposed the bond in a broadcast message sent out yesterday, Springfield District voters thought otherwise, voting 23,834 to 11,220 in support of the bond. Direction: Rte. 286 N/B Fairfax County Parkway. Where: From Dulles Toll Road to Sunset Hills Road. What: Temporary Bike Trail closure. 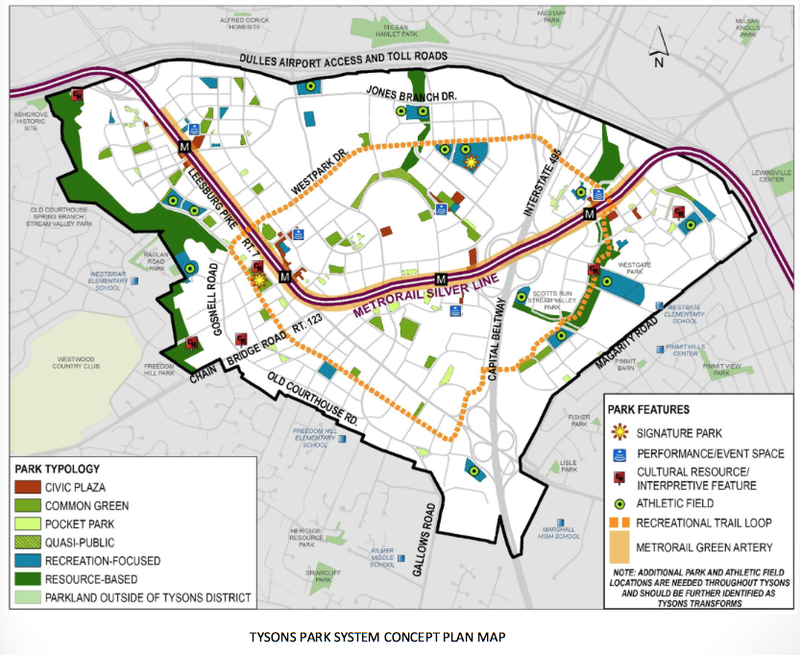 Fairfax County recently developed a comprehensive parks plan for Tysons. As Tysons transforms from a car-dominated commercial center to a mixed use, transit-oriented area with many more residents. Those residents will want safe places to walk and bike and parks recreation and other outdoor activities. The plan includes a recreational trail loop connecting many of the current and future parks. 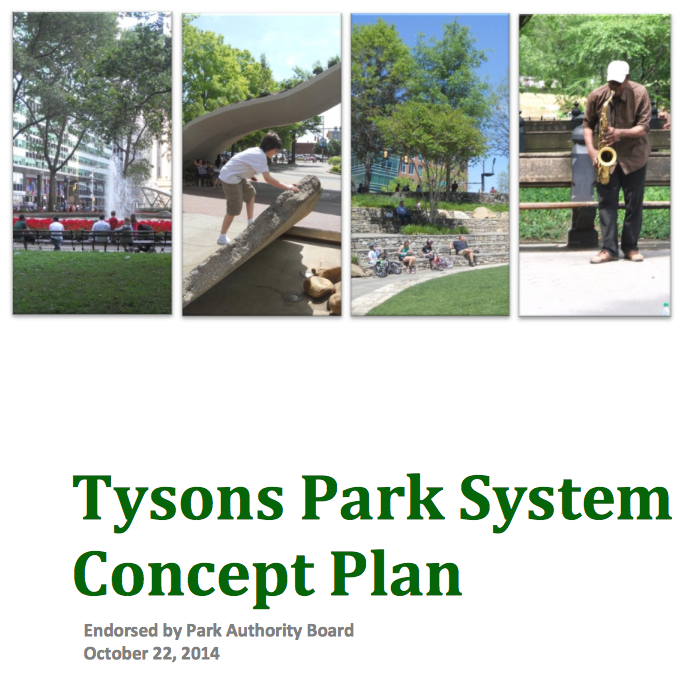 Thanks for participating in the planning process for the Tysons Park System Concept Plan! We considered the many public comments on the draft Plan received during last spring's public outreach process and made some minor revisions to the Plan as a result. A final, revised document was presented to the Park Authority Board's Planning & Development Committee in September and was endorsed by the full Park Board on Wednesday, October 22nd. See related info on the Tysons Park Planning project website. The Park Concept Plan will now be used to inform Phase 3 of the Tysons Urban Center Plan Amendment. Possible changes to the Tysons Comprehensive Plan pertaining to parks and recreation will be discussed at public meetings held by the Planning Commission's Tysons Committee beginning in January 2015. Please vote YES tomorrow for the 2014 Transportation Bond. The bond is supported by the League of Women Voters, the Partnership for a Healthier Fairfax, and many other organizations. A significant portion of the bond will go towards building pedestrian and bicycle infrastructure. Most of those projects are missing sidewalk links that should have been built years ago. The majority of the county's $1.4 billion in transportation projects are major road and transit projects. The $85 million in ped/bike projects in the bond is a only 6% percent of that total. The major road and transit projects will be funded primarily using new state funds (from HB 2313). Since the county has decided ped/bike projects do not qualify for those funds, the Transportation Bond will be used to fund them. In September 2014, VDOT completed its Pedestrian Policy Plan. As stated on the VDOT website, the purpose of the plan is to establish a vision for the future of walking in the Commonwealth and to advance the walking element of the Commonwealth Transportation Board’s Policy for Integrating Bicycle and Pedestrian Accommodations consistently, appropriately, and cost-effectively. The recommendations in the plan will advance the policy more effectively and will involve a wide variety of partners within various divisions of VDOT, as well as stakeholders throughout the Commonwealth. Considerable discussion was held about the US Bicycle Route 1 in Northern Virginia. The new route location and sign plans have been submitted to the approving authorities. As many as 80 new signs will be needed to keep riders from getting lost. Funding, however, for the signs could be a problem. 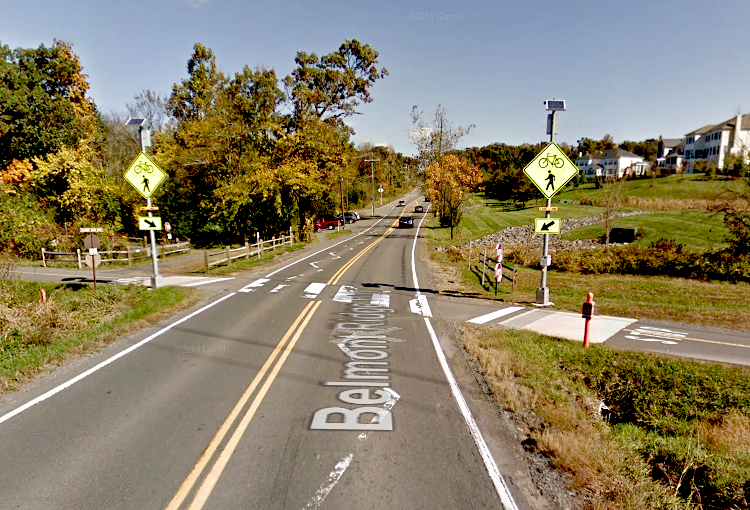 Champe Burnley commented it would be good to have all the signs installed in 2015 so the upcoming bicycle visitors could enjoy the route to Washington, DC. Champe asked if donations could be made to pay for the signs. VDOT staffers said they would have to see if accepting donations for signs was legal. Mack Frost from the Federal Highway Administration spoke about the USDOT Secretary’s new safety initiative. USDOT will select one city in each state to illustrate that bike and pedestrian safety is important. Congressional leaders and the public need to know that bicycle and pedestrian travel modes are just as important as driving, flying and riding trains and subways. The Federal Transit Administration will be coordinating the effort within Virginia. Location for the one-day program and publicity tour will most likely be in Hampton Rhodes, Richmond or Northern Virginia. See the handout with more details of the safety initiative. John Bolecek commented that the easiest bicycle improvement is to restripe lanes when repaving or to widen road shoulders on high priority roads. He encouraged everyone to look at the roads to be repaved to see if a change to accommodate bicycles would be appropriate. He told participants to call him if they needed help with the process. A discussion was held concerning how the progress made in Virginian since 2004 when bicycles and pedestrians were to be given equal consideration. Some suggested that VDOT internal audit would be the best group to evaluate the progress. Others commented that since John works for the State Engineer it may be hard to ask that such a review be undertaken. John reported he was asked to update the state highway plan. He plans to include bicycles and pedestrians in the plan, and will focus on long distance bicycle trails and those that parallel state bike routes, and include other projects that make good sense. As a performance management tool, John is suggesting that a new data field be added to VDOT planning documents to capture information showing how bicycle and pedestrians were included in projects. VDOT participants said measuring accomplishments would be much easier if the information was recorded. John said he would talk to others at VDOT to see what could be done to have the new data field developed. The longstanding, continuing debate of reducing maintenance allocations when road diets are used in towns and cities was again discussed by the committee. Champe Burnley suggested the committee write a letter to the VDOT Secretary outlining the committees concerns. John commented that the committee advises him and that he advises the State Engineer, who advises the VDOT Secretary. Charlie Shrunk suggested maybe state legislators needed to become involved to help resolve the dilemma. John said he would again raise the committee’s concern with the State Engineer. A discussion was held about the importance of getting bicycle and pedestrian counts to monitor the use of bicycles. VDOT has permanent continuous count stations at many places in the State as a requirement of getting Federal funds. Sometimes a bike counter can be added to the counters at little or no cost. Bicycle counting systems are relatively new and rely on differing technologies e.g. video tapes that are scanned and counted, a light based system that detects turning wheels, or a GIS application that some cyclists use to monitor various cycling activities. Strava www.strava.com has interesting features but does not capture all bicyclists. Each counting station costs $5,000 to $6,000 which includes batteries, maintenance and data management. A detailed presentation based on a University of Virginia doctoral dissertation was given illustrating how bike data could inform local transportation decisions. The speaker stressed the need for getting more data about bicycle data into nationwide records systems. Details about the next committee meeting will provided once a date is selected.